Prime factorization is finding prime numbers that, when multiplied, equal the original number. The best and easiest way to do prime factorization is to use a factor tree. In this example, we will look for the prime factorization of 90. 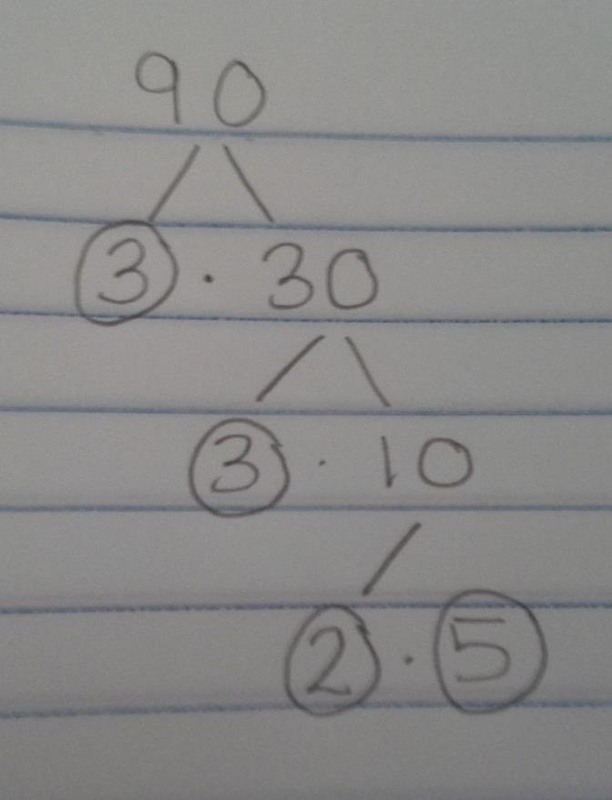 Using a factor tree, we will find all of the prime numbers that when multiplied, equal 90, and circle them. The prime factors of 90 are 2, 3, 3, and 5. If a number is already prime, the prime factorization of that number is itself. For example, the prime factorization of 13 = 13 because 1 and 13 are the only prime numbers that can be divided evenly by 13. What is the prime factorization of 19? What is the prime factorization 22?